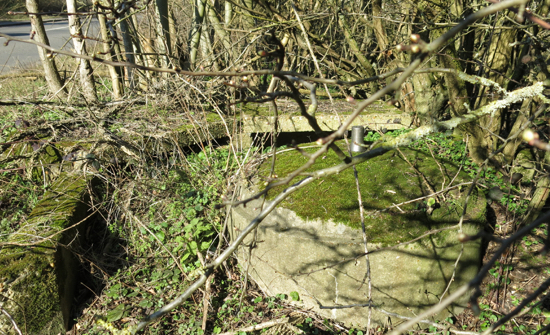 Hidden in the hedgerows and woodland surrounding the Brookmans Park Transmitting Station are the remains of three wartime spigot mortar emplacements. One is in good condition, one is partially buried in earth, and one was excavated in 2018 by local historian Peter Miller the joint author of this feature. It's thought there could be a fourth emplacement to the south and east of the transmitting station, but so far it's not been found. 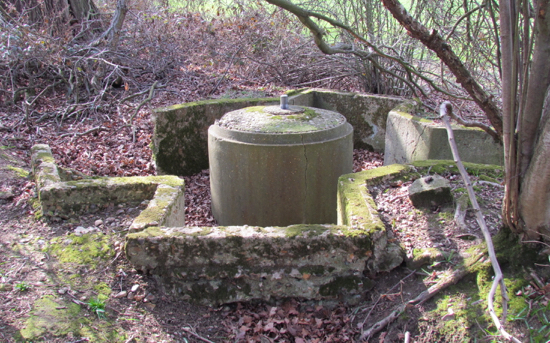 The emplacements that have been discovered are located on the north-west, south-west and north-east corners of the original transmitter site. 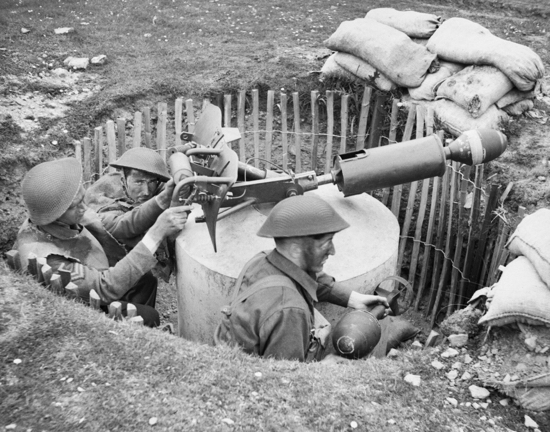 Soldiers, possibly Local Defence Volunteers (later known as the Home Guard), would attach their spigot mortars and guard against enemy attack. 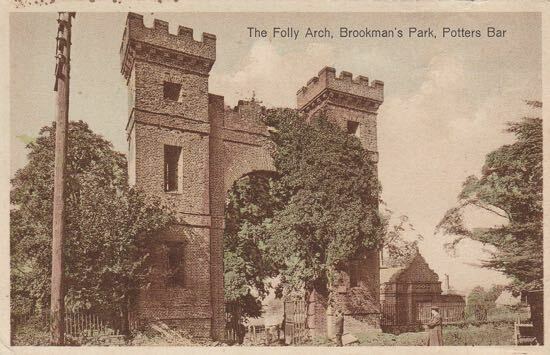 The nearby old Brookmans Lodge was the HQ for the Brookmans Park Home Guard. Take the footpath almost opposite the north entrance to Uplands Drive off the A1000 and head east as it skirts the northern boundary of the Brookmans Park Transmitting Station. When you reach a field, cross the small footbridge, turn right and follow the path round to the left past the water tower. Now look to your right. 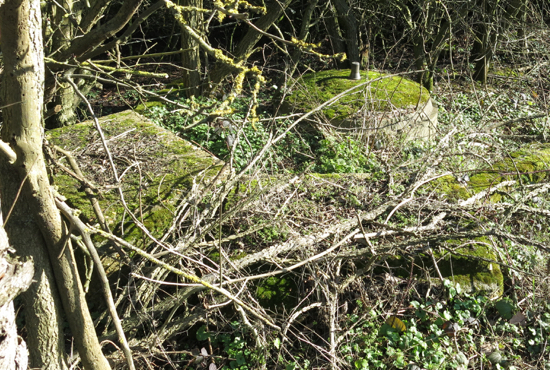 There deep in the hedgerow is an almost perfectly preserved spigot mortar emplacement (Grid Ref: TL 26144 05177), so well hidden that it was totally missed by the Defence of Britain survey, carried out by the Council for British Archaeology. 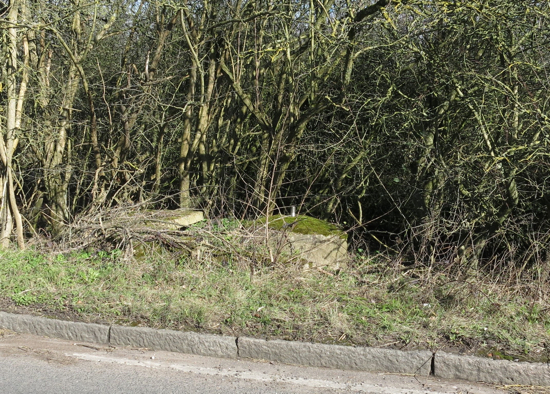 Return to the A1000 and you will find another previously undocumented mortar emplacement located on the east side of the road diagonally opposite the south entrance to Bell Lane (Grid Reference: TL 25627 05115). The following eight images below were taken on the 24 February 2018 by local historian and archivist Peter Miller. 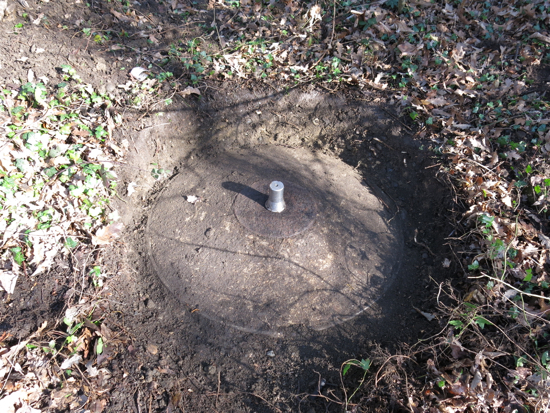 This spigot mortar emplacement was mentioned in the Defence of Britain Project. It's located on the east side of the A1000, approximately 15 metres north of the north entrance to The Cuttings. (Grid Reference: TL 25942 04677). The three images below were taken on the 24 February 2018, the last two after about 30 minutes digging to remove a section of the top soil that had accumulated over more than 70 years. 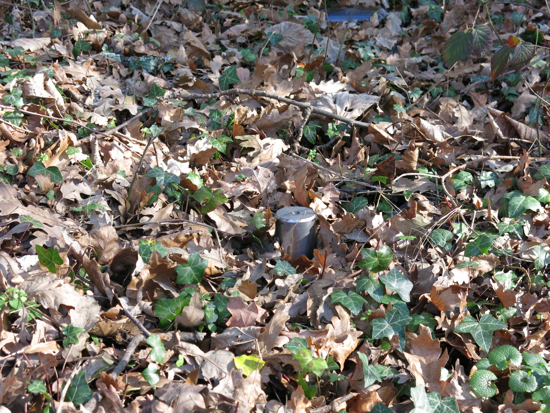 We have yet to find the fourth spigot mortar emplacement, but it's believed to be on the northern side of Kentish Lane (B158), south of the Brookmans Park Transmitting Station. 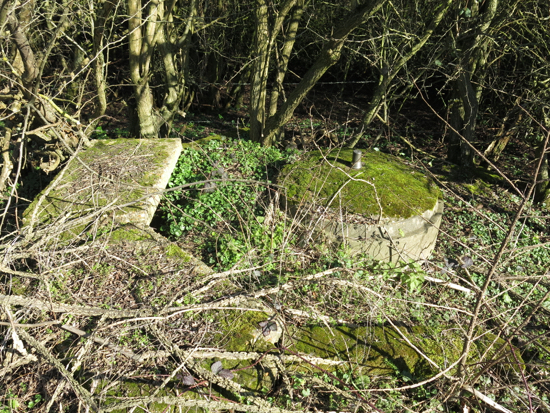 If anyone has any information, photographs or a grid reference for this emplacement, please let us know by using the contact form at the bottom of the right hand column of this site. 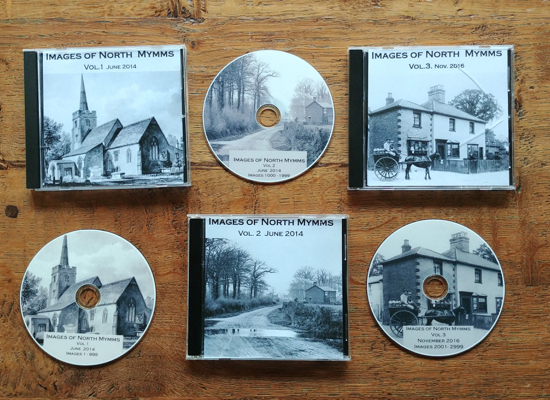 We would really like to photograph it for the North Mymms History Project. 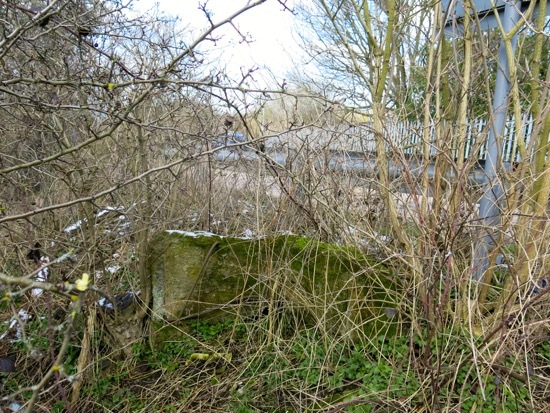 In March 2018, local historian and archivist, Peter Miller, heard from a local resident who reported playing on the site of an emplacement near Brookmans Park station as a child in the 1960s. 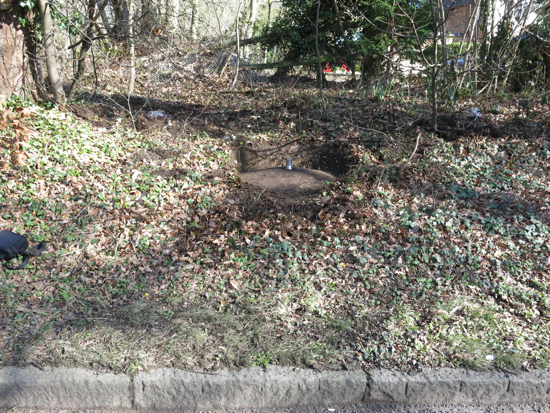 Peter investigated and found the remains of what appears to be a strategically placed emplacement, possibly a spigot mortar emplacement, to the west of Station Road at the right-angle bend by Brookmans Park station (Grid Ref: TL 24055 04117). Peter says the position would have would have had 360 degrees visibility and was, therefore, strategically placed, with a clear line of sight to the east over the railway bridge, to the north along Station Road, to the west across open fields, and to the south alongside the railway track. “It has clearly been placed where it is because it’s the highest point and covers the road in both directions from this point. It seems to have been placed strategically to either oppose troops approaching along the road and more importantly, protect the bridge and railway line below." Another local resident, Francis K, recalls playing on the emplacement as a schoolboy. "I seem to remember it had sighting/firing slits in its wall. It was roughly a shallow 'U' in plan, much like a traditional domestic bay window wall. There was no organised floor behind, just bare earth, which was eroding back then and somewhat undermining the wall itself. The facing of this was towards Bradmore Green, in other words apparently in anticipation of an attack from the village, unless this actually indicated the loss of further structure defending the western aspect." If you have any memories please share them using the comment box at the foot of this piece or by emailing us via the form at the bottom right of every page. The spigot mortar (gun) was mounted on a stainless steel pin set in a concrete base. 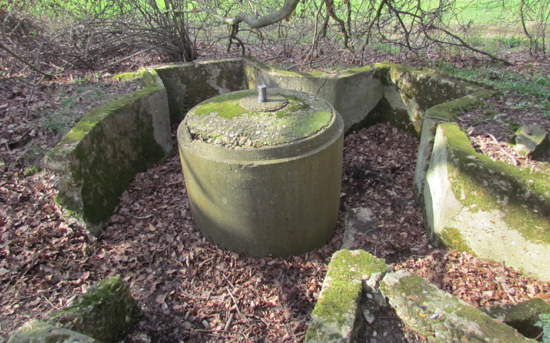 The concrete sides had indented areas where the gun crew (usually three) crouched. The spigot mortar was also known as the Blacker Bombard and was invented by Lieutenant-Colonel Blacker. The intention was to design a cheap and easily-produced weapon (after most of the British Army's heavy equipment had been lost at Dunkirk). The spigot mortar was extremely heavy (around 350lbs), and had a four-legged portable mounting. It is said it needed a crew of six to move it. The weapon would fire 20lb high-explosive mortar bombs, which were propelled by black powder. It had an effective range of 100 metres in its anti-tank role, and a range of up to 450 metres when firing a lighter anti-personnel bomb. It had one major drawback. When the warhead hit its target, the fins would often fly backwards with the resulting danger of injury to the firing crew. The spigot mortar was rejected by the regular army, but saw service with Home Guard and airfield protection units from 1941-1944. 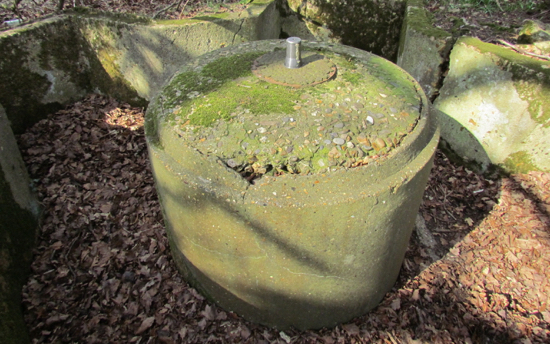 The location of the Brookmans Park spigot mortar emplacements is interesting, perhaps the location was chosen to help protect the Brookmans Park Transmitting Station against a land attack, or possibly to destroy it to prevent it falling into enemy hands. 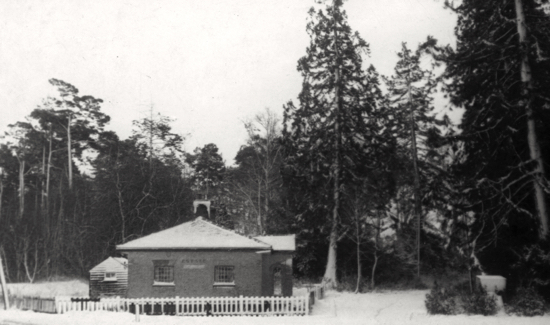 The facility was probably worth defending during the war years as author Lilian Caras explains in her study, "A History of Brookmans Park Transmitting Station". "When France was invaded in June 1940, there was a need to increase the power of the existing European Service and to overcome jamming from Europe. Consequently, a powerful 140 kilowatt transmitter was installed at Brookmans Park in an extension to the original building, which came into service on 2 March 1941. "The station was of strategic importance to the war effort. To reflect this, the building was painted in camouflage paint and the windows bricked up or had metal shutters placed over them. Soldiers were camped in the driveway to guard the station. "Although the original targets are unknown, unexploded bombs fell in Georges Wood Road and Moffats Lane, Brookmans Park in November 1940, missing the nearby transmitting station." There is a small book, reproduced in full on this site, about the Brookmans Park Transmitting Station entitled, "The London Twin-Wave Broadcasting Station Brookmans Park", which was an official BBC brouchure, produced in 1930. 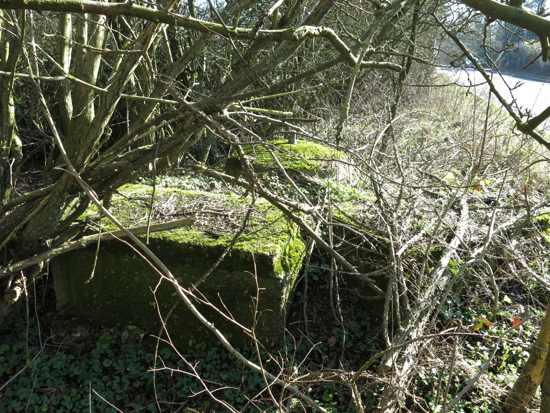 This site contacted the Defence of Britain Survey about the emplacement, but was told that the survey was now closed to new finds. Details have now been sent to Hertfordshire County Council.